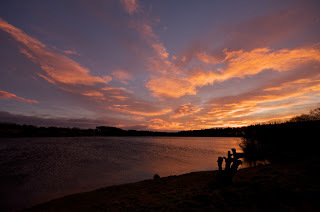 I guess this is my favourite local place to photograph sunrises. I have some from earlier in the year or maybe last year where the sky was beautiful and the water was perfectly still so the reflections were almost perfect. Today the sky is good but it's very windy so the reflections aren't their best. All of the photos today are from more or less the same place, just moved around a little and tried different heights, magnification and exposure settings. 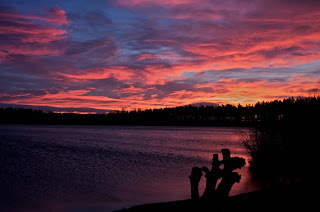 When I shot this first photo it was still pretty dark and the exposure time was set to 30 seconds which has really exaggerated all of the colours in the sky. 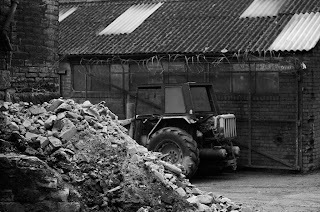 I like this spot for making the photograph because it has the old bit of tree stump in the foreground. I tried using the flash to put some detail into the foreground but I think it looks better without any detail and the tree sump as a silhouette. Again it was still quite dark and the long exposure makes the colours very rich. 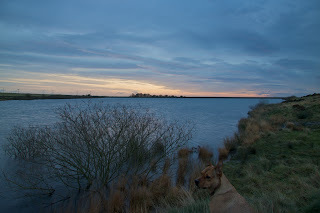 I had my daughters dog with me and on a couple of the long exposure photographs it had run into the shot and then moved off after a few seconds leaving a ghost dog in the picture. Here I put a telephoto lens on the camera to zoom in to the brightest part of the sky just above the trees. It was a little later so the sky was a bit brighter and turning more yellowy. 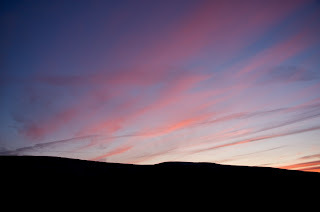 Changed to a very wide angle lens to capture a big area of the sky. The previous photo was just the little bright patch where the sun is coming up directly above the tree stump in this photo. Last photo back to a normal lens length and quite a bit later. The sky was a lot brighter so the exposure was down to less than a second by now. 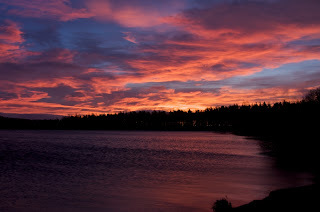 The colours on the photo are more like how they looked when I was there and some blackish clouds are starting to come over. We set of home shortly after this and it started to rain just as we got back to the car. 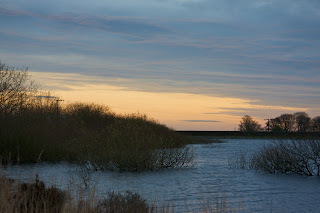 When we got home the weather was quite miserable so I'm glad we went out early to capture the best of the day. It's Saturday morning and a bit overcast. 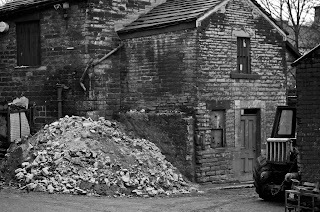 I have about half an hour in Holmfirth while my wife is getting her hair done so I thought I'd make some photographs of the old forge. I think it is a quite good subject for a black and white exercise so here's my attempt. It was a wet and miserable day but I'd promised my daughter that I would take her dog for a walk. 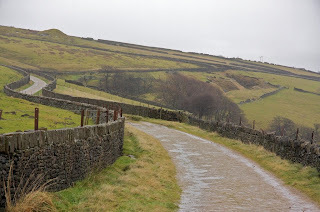 It had been raining for a while so I decided to go to Digley because there are good paths around the reservoir and some old roads on the surrounding hills. 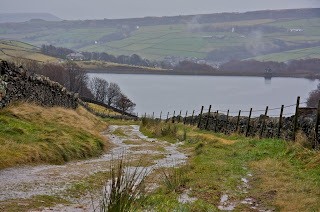 From the northside car park I walked up the road towards Meltham and took the first left by the side of a converted barn an onto the old disused road above the reservoir. 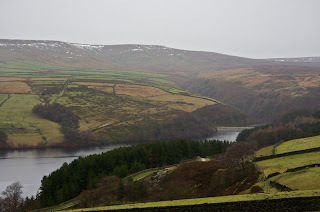 This first photo shows Digley reservoir and then in the middle distance is Bilberry reservoir (the one that burst in 18 something and flooded Holmfirth). 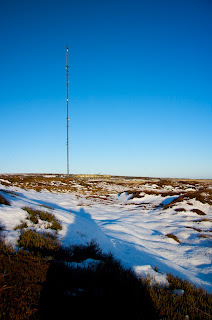 In the far distance you can still see a bit of snow near Holme Moss. 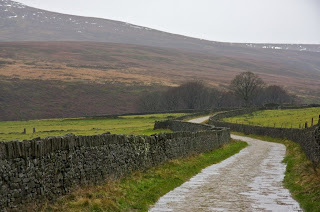 The next two photos are going along the disused roads above Digley which wind around the fields. 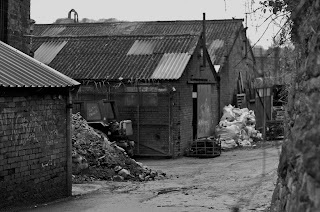 They aren't completely disused because the farmers use them with their vehicles and they are used by cyclists, horse riders and walkers. 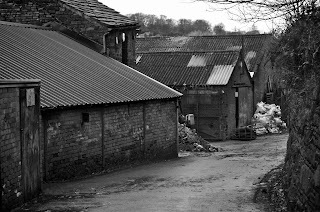 This particular road is quite well looked after because it is used by the residents of a couple of barns that have been converted. There are many other roads in this area that are in poor condition and some barely passable even on foot. 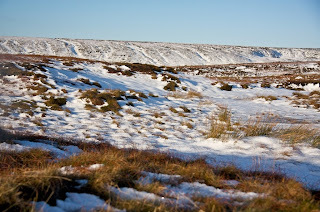 The next photo is one of the less looked after roads that drops down towards Digley reservoir. 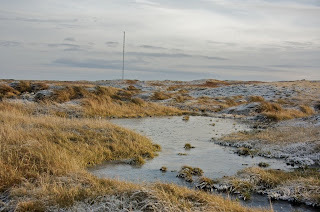 As you can see when it rains there is a bit of a stream going down it which accounts for its condition. The sides are very damp and have reeds growing in them and the other day when I came here the water was fozen solid and very slippy. 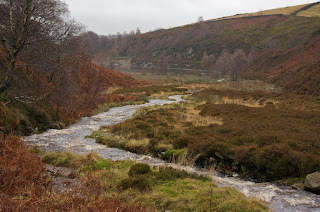 This last photo is of the main stream that flows into Bilberry reservoir. We're not supposed to come up here, but we do. When we first moved to the Holme Valley about 35 years ago we often came here in the summer to sunbathe and paddle in the stream. Further up the stream there are some nice pools that are good for bathing and playing about in. In the future I will go further up this stream and make some more pictures. 8th December - first catchup post, no excuse just being lazy. 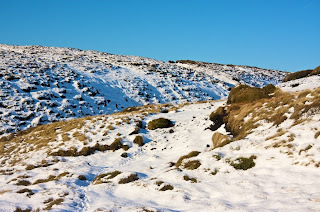 The day after the snowbound trek over Holme Moss I took my youngest daughter and her boyfriend to Dovestones. It's a pretty gentle walk on mainly good paths so it was quite easy going after the previous days exersions. There are four reservoirs here. 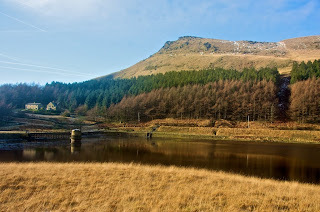 Dovestones is the main one, then further up this valley is Yeoman Hey and the Greenfield. 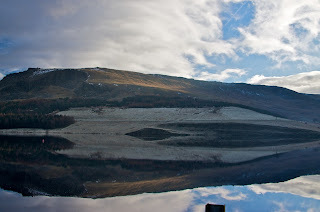 The last reservoir is a way up the other valley up the old Chew Road. We just went around the first two reservoirs on this visit. 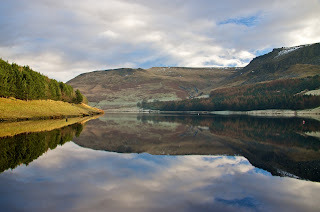 It was a nice bright morning and the first three photos are from more or less the same spot showing some nice relections in the still water of Dovestones reservoir. Looking up Chew valley where there is a road that takes you up onto the top where the fourth reservoir is found. 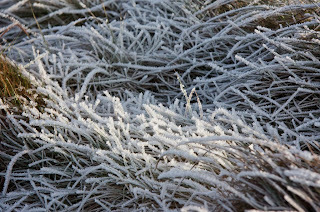 The bank on the south side of the reservoir was in the shade and the grass had a good covering of frost on it from the cold night. 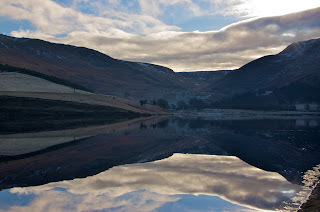 The next photo is one of the channels that bring water to the Dovestones reservoir. 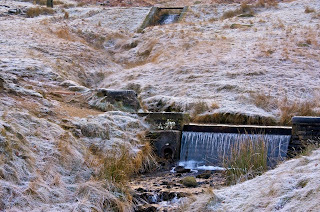 The source of this channel is actually from the third reservoir, Greenfield, and goes through a tunnel in the hillside next to Yeoman Hey reservoir then comes out above the weir that can be seen in the distance. During the summer when the water is low it is possible (although not permissable) to walk through the tunnel. 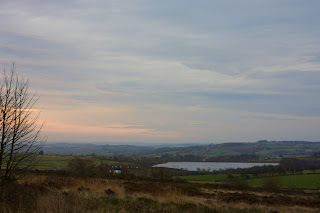 This last photo is looking across Yeoman Hey reservoir up to the edge of the Peak District above Greenfield village. There is a path that goes up to the top which I intend to follow one day because I think the view will be quite stunning. I have previously climbed up to the top of the ridge on the south side of the reservoirs which you can see in the first couple of photos and it was extremely windy that day. 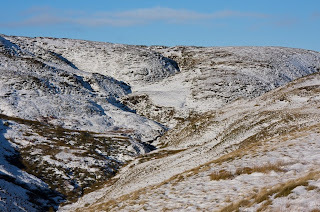 We've had a couple of days this week when it's snowed and as usual the road over Holme Moss has been closed. Fortunately it had been re-opened by Friday night because my youngest daughter, her boyfriend and I went to see Jimmy Carr at the Manchester Apollo and came back this way. 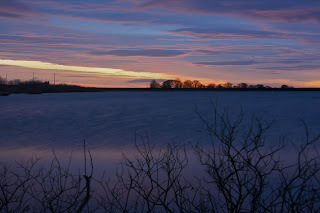 Although it was dark I could see that there was still a bit of snow, so I decided to go out on Saturday morning to make a few more photos. 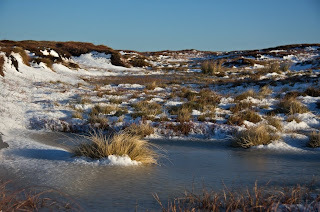 When I got up to the car park it was deserted but I took a few photos from near the car park and then set off across the moor in the direction of Black Hill. 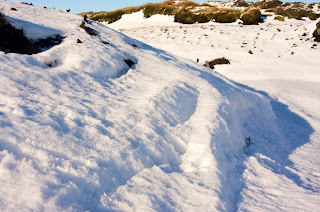 The snow had a layer of ice on top off it and it made the going quite hard, especially as I strayed well off the main path as normal. 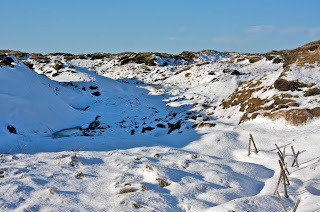 I didn't go all the way to Black Hill but spent a bit of time wandering about looking for interesting shapes in the snow to photograph. 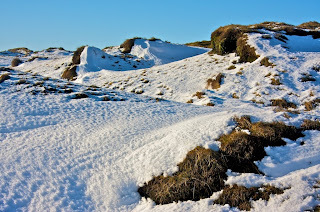 Unfortunately because I'd taken a lot of photos last week of the frost on Black Hill I'd used my portable card reader and forgot to put it back in my back pack, so once I'd filled my two memory cards I'd run out of space for any more photos. I had room for 7 more photos when I set off back towards the car park so I could only take a few more as I walked back. 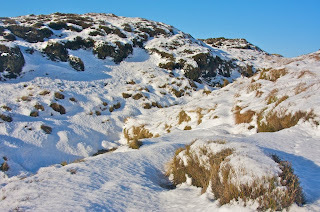 As I walked back I spotted a guy running from the direction of Black Hill. I noticed that he kept stopping and looking at a map after he'd gone past me. 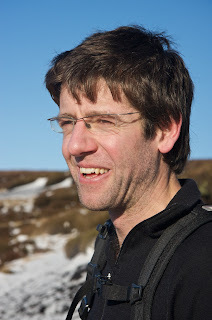 A little later I saw him on the ridge above me heading back towards Black Hill. I shouted up to him and asked him if he was lost. He said no, he was looking for an orange ribbon. 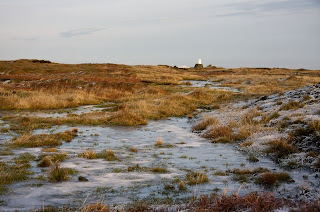 Apparently he was doing a sort of treasure hunt where he and his friend took it in turn to leave the ribbon somewhere and then pass the grid reference to the other to find it and put it somewhere else. We chatted for a while and he told me he was also a photo enthusiast. I used my last 3 shots taking his picture. He was looking straight into the sun and unfortunately on the other two he had his eyes closed. I gave him my name and asked him to look at my blog and website so I've made sure to add the photo here. 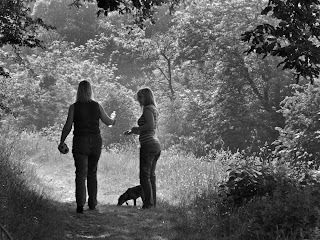 If I ever get around to updating my website again I will have to add all the photos of people I've met as I've wandered about. I must also have some cards made so I can give them to people I photograph. The running guy. Unforunately I forgot to ask his name, but if you do read the blog thanks for the photo and if you'd like me to send you a copy of the full size file send me an email. A bit of a delayed post I'm afraid. 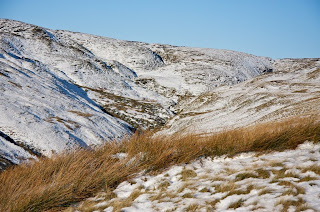 I went out last Sunday and took these photos of the frost on Black Hill near Holme Moss on the Pennine Way. I'd taken around 400 photos and haven't really had time to sort them out until now. 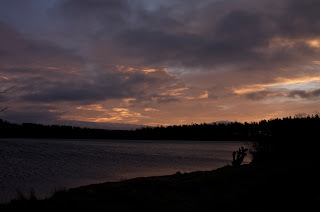 It was mid afternoon when I set off from home and it had got pretty dark before I got back to the car. Quite a lot of the ice had melted by the time I arrived and what was left was just mainly in the shadows and therefore a bit dark to make any decent photos. 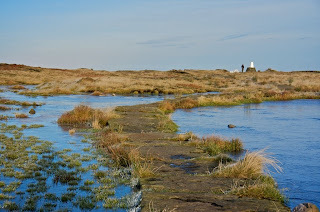 Pennine Way path through a pool looking towards the Trig Point. 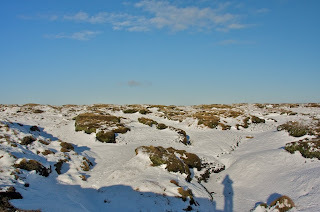 I think the guy next to the trig point was also taking photos but I never got to talk to him. 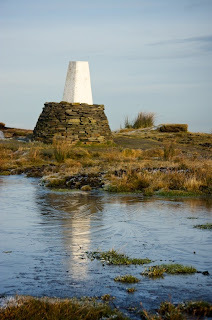 The cairn with the late evening sun on it. 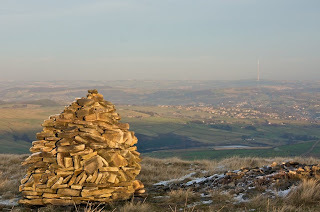 Down below is Digley Reservoir and then Emley Moor television on the horizon. 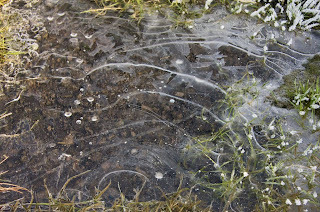 I took a detour when I went back to the car where I crossed a small stream with these icicles on the grass. 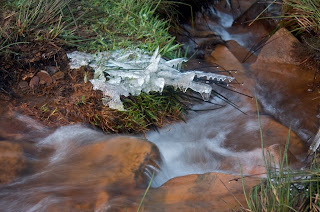 It was getting quite dark by now and the shutter speed was quite slow which makes the running water look quite nice. There were 79 entries in this competition which I'm guessing is a bit of a record for the club, certainly in recent years. Up until this year the membership had dropped to around 20 so even if everyone had entered the maximum of 3 photos they could only have mustered about 60. The membership has just about doubled this year so potentially there could be well over a hundred photos in a competition. 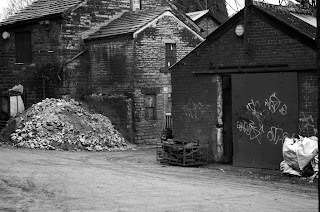 I was a little late turning up but I believe the judge was from a Dewsbury camera club and generally I tended to agree with his comments on most of the photos. I was a little disappointed that he didn't expand a bit more on some of the things he said but I guess he was a bit pushed for time. As usual there were a few that I really thought he'd got wrong, but then it's all a bit subjective as to what different people like in a photo. He'd down marked one photo because it wasn't really monochrome (which includes tinted monochrome as well as black and white) as it had more than one colour in it, but I think there was another that was a bit suspect which he didn't mention at all. The photos are marked out of 20 and the winner, second and third usually get 20, 19 and 18. He'd decided to mark one at 20 and then 3 photos at 18, which I guess is OK. There were a couple of 17s, half a dozen 16s quite a few 15s and the majority 14 and below with one he really didn't like with 8. 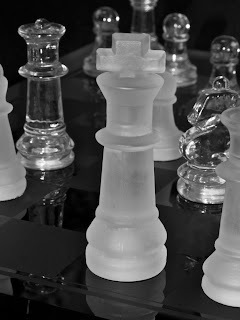 I was quite happy with my scores, the chess pieces got 16, the one of Lynne, Emma and Evey dog got 15 and the couple I met at Black Hill got 13 (see previous post), so I'm thinking they were a bit above average. Just got back from the camera club where we had a Photoshop evening where one of the members showed us how to add a sky to a photograph that has a bland white sky. It was quite interesting in showing a different method of doing this to what I'd seen before. The thing with Photoshop is that there's lots of ways of doing things and everyone has their own favourite. There was supposed to hav been another presenter but he didn't turn up so we got finished early. 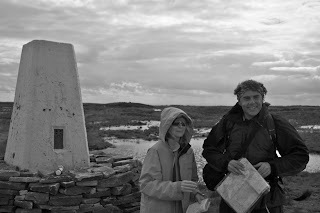 A couple that I met on the Pennine way at Black Hill trig point near Holme Moss television mast. 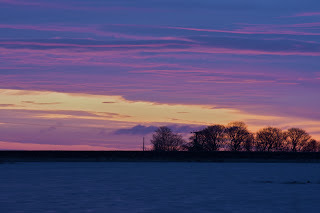 Got up really early again this morning to try and get some decent sunrise photos but again it didn't quite get there. As usual the sunrise started off looking promising but then there was just too much cloud as the sun got over the horizon. 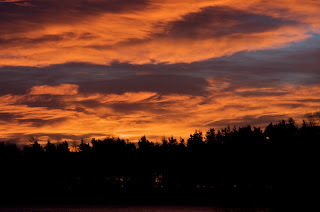 There was a great sunrise on Thursday morning but I had to go to work. I did have a disposable camera on me on Thursday morning so I took a slight detour but I don't know how they will turn out because I have to wait to fill the roll before I take it to be developed (it's a camera club competition in January). After the sun came up I went home for breakfast and then spent the rest of the morning and part of the afternoon collection leaves from the garden. My compost heap is now stacked up about 4 feet above the top. Unfortunately the leaves are wet otherwise I'd set them on fire to try and reduce the bulk. 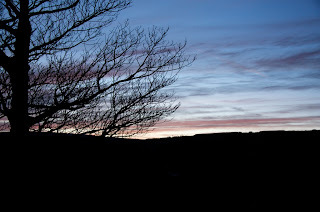 After that I went back out and took a few more church photos at Kirkburton and Shelley and then it started getting dark so I went up to a bridle path above New Mill and made some sunset photos. Unfortunately I hadn't anticipated being out so late so I didn't have my tripod. I haven't had time to look at them yet but I might post some of them to the blog later in the week. Anyhow here's some of the best photos from this morning. As usual double clicking on them will bring up a bigger view.